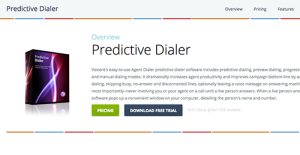 What is Voicent Predictive Dialer? Voicent is a VoIP software application that offers an easy-to-use predictive dialer software product named Agent Dialer that can boost your productivity and improve campaign bottom-line. The product dials automatically skips busy, disconnected, and no-answer lines, and leaves a voice message optionally on answering machines. Your agent does not need to get involved until a live person answers. When this happens, the software opens a window on the agent’s computer that shows the person’s name and number. Agent Dialer is affordable and easy to use. Agents can use the predictive dialer to minimize unproductive calls and focus better on phone conversations with customers. Agent Dialer is flexible and scalable. It does not need costly telecom hardware or phone lines. Calls are made directly by your computer through the internet. You only need a computer and a USB headset to talk to your customers. The Agent Dialer system can record conversations for quality control and training purposes. The software can work in predictive dialing and semi-automatic dialing mode. You can lower your operating cost by choosing the most affordable phone service. Call center outbound campaigns with multiple agents. Business marketing campaigns by a single user. Political campaign phone bank to contact more voters. Call campaign to deliver consistently uniform sales or marketing messages by agents. Each company has different wants and requires a system that can be personalized for their size, type of employees and customers, and the particular industry they are in. For these reasons, no platform can provide perfect functionality out-of-the-box. When you look for a software product, first be sure what you want it for. Read some Voicent Predictive Dialer reviews and ask yourself do you desire basic tools or do you require complex features? Are there any industry-specific functionalities that you are searching for? Find the answers to these questions to aid your search. There are multiple elements that you need to mull over and these include your finances, particular business requirements, your company size, integration needs etc. Take your time, use a few free trials, and finally zero in on the platform that presents all that you want to enhance your organization efficiency and productivity. How Much Does Voicent Predictive Dialer Cost? We realize that when you make a decision to buy Communications Software it’s important not only to see how experts evaluate it in their reviews, but also to find out if the real people and companies that buy it are actually satisfied with the product. That’s why we’ve created our behavior-based Customer Satisfaction Algorithm™ that gathers customer reviews, comments and Voicent Predictive Dialer reviews across a wide range of social media sites. The data is then presented in an easy to digest form showing how many people had positive and negative experience with Voicent Predictive Dialer. With that information at hand you should be equipped to make an informed buying decision that you won’t regret. What are Voicent Predictive Dialer pricing details? What integrations are available for Voicent Predictive Dialer? If you need more information about Voicent Predictive Dialer or you simply have a question let us know what you need and we’ll forward your request directly to the vendor.